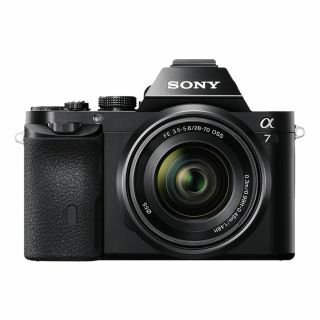 Amazing full-frame mirrorless camera Christmas deal: Sony A7 for just £509! This is one of our favourite Christmas camera deals – and a great gift for anyone who wants to get into photography, or who fancies upgrading to mirrorless and to full frame. Amazon has lopped 25% off the price of Sony's original full-frame mirrorless A7 with the 28-70mm f/3.5-5.6 standard zoom lens. This is a repeat of a fantastic Black Friday deal, but is only available today - so act quick if you are interested. That takes the camera and lens package down to just £659 – and with Sony offering a further £150 cash back, the price drops to an incredible £509. Yes, that's right... you can go mirrorless and full-frame for just over 500 quid (and that does include the price of the standard kit zoom). That's £366 off the list price, and is the lowest price we've ever seen on this bundle – matching the Black Friday deal, and beating the Amazon Prime Day deal earlier this year that sold out in 24 hours. Sony’s original A7 was a game-changer – the first camera to squeeze a full frame sensor into an interchangeable lens camera that was smaller than a typical DSLR. It is still a beautiful-looking camera, and although it lacks some of the toys of its successors is a serious bargain at this price. It's been superseded now by the A7 II and A7 III, but remains a fantastic choice for anyone wanting to make the move to a full-frame or mirrorless camera.